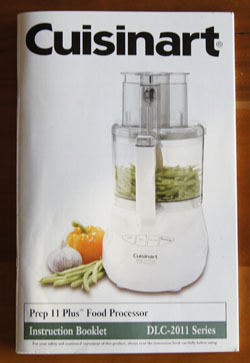 Cookbook #186: Cuisinart Prep 11, Cuisinart, East Windsor, NJ, 2001. Included in this instruction booklet are about 40 recipes for appetizers, soups, breads, entrees, pizzas, sauces and dressings, sides, and desserts. The instructions for all recipes are excellent. 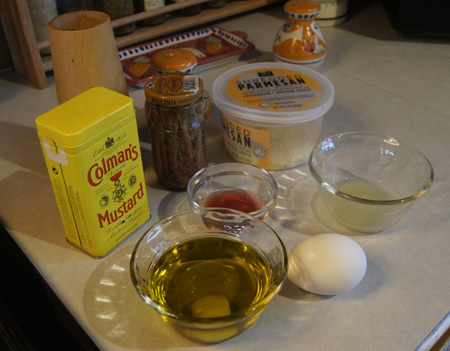 I love the recipe for hummus – have made it many times. Although I have my own banana bread recipe, I read with interest the one in this booklet: finally a recipe that does what I came up with on my own. Why hand mash bananas? Use a processor, mix the bananas with other wet ingredients, and then fold in the mixed dry ingredients. I have used the pizza dough recipe, but not often. You can use the dough blade and the unit to knead yeast breads, but I rarely do. The pesto recipe on page 43 is excellent and I have used it lots. As the instructions state, this pesto “is lower in fat than traditional pestos, and just as flavorable”. It makes a lot, but can be frozen (I’ve frozen it before in ice cube trays). Creamy Chevre and Peppercorn Dressing catches my eye. 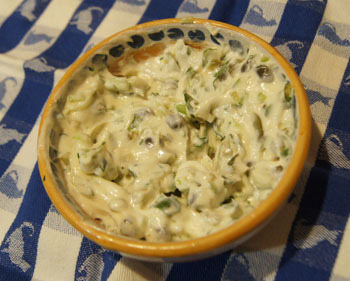 This is a salad dressing with shallots, green peppercorns, lemon, vinegar, sour cream, and olive oil. I think I’ll make it for this blog! 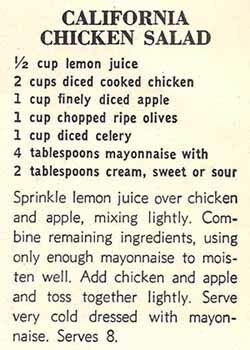 If I ever want to make my own mayonnaise using a food processor, I would use the recipe in this booklet. I use a modified version of the french-cut green beans on page 54. Generally, I start with the chopping blade in place, then run the machine andI drop in a clove or two of garlic. I leave the garlic in the bowl, but remove the blade and insert the slicing disc and use it to process the green beans. Then I dump the lot into a sauce pan and saute in butter for a few minutes, add water and cook another few minutes, drain and serve. I will definitely save this cookbook. I noted at least 10 recipes to try! 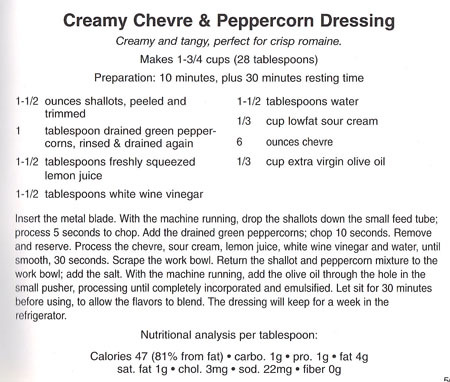 Below is the recipe for Creamy Chevre and Peppercorn Dressing. “Chevre” is more commonly called “goat cheese”, at least where we live. I have used green peppercorns before (ages ago), and they were packed in brine, as called for in the printed Creamy Chevre & Peppercorn Dressing recipe. According to my Food Lover’s Companion, “the green peppercorn is the soft, underripe berry that’s usually preserved in brine. 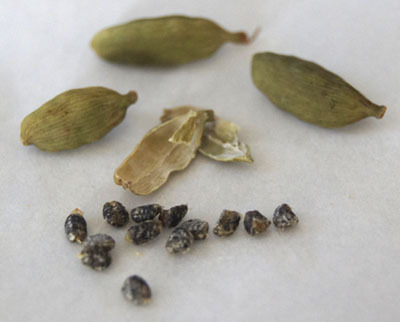 It has a fresh flavor that’s less pungent than the berry in its other forms”. 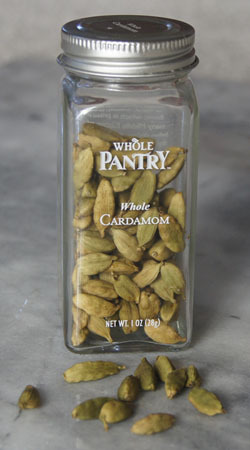 But all I could find on my venture to Whole Foods was a spice jar of hard, dried green peppercorns. I bought that jar, and soaked a few peppercorns in a mixture of salted hot water and vinegar for awhile, then drained. They were still pretty hard. Thinking they are sort of like capers flavor-wise, I used half a tablespoon of these peppercorns and half a tablespoon of capers. If you can’t find brined green peppercorns, I suggest substituting with a teaspoon of capers and then grind some fresh black peppercorns into the dressing to your own taste. Insert the metal blade in a food processor. Start the machine, and drop the shallots down the feed tube; process 5 seconds. Add the green peppercorns and process 10 seconds. Scrape the mixture out of the bowl and reserve. Add the lemon juice, vinegar, water, sour cream, salt, and goat cheese to the food processor bowl. Process until smooth, about 30 seconds. Scrape down the sides of the bowl and add the shallot/peppercorn mixture. Start the machine running, and slowly add the olive oil through the feed tube. Process until all the olive oil is added and incorporated. Remove the dressing from the processor. Let stand at least 30 minutes for the flavors to blend. This dressing will keep for a week in the refrigerator. Below is a photo of my just-finished dressing, still in the processor. You can see I have a couple drops of olive oil still on top. I honestly didn’t think my husband would like this goat cheese dressing. So when I made up our salads, I only dressed mine, and told him he could make his own choice. He ended up choosing the goat cheese dressing, and he liked it! He even chose it the next night too. Me? I love this dressing. 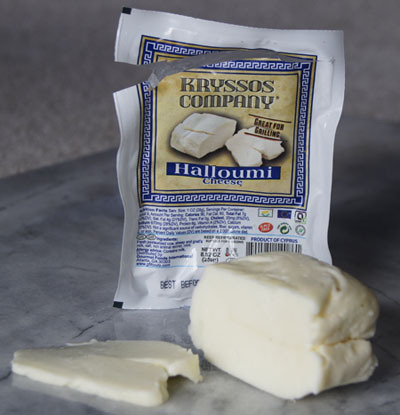 It’s creamy and pungent and only about 50 calories in a tablespoon. It was even better the second night. 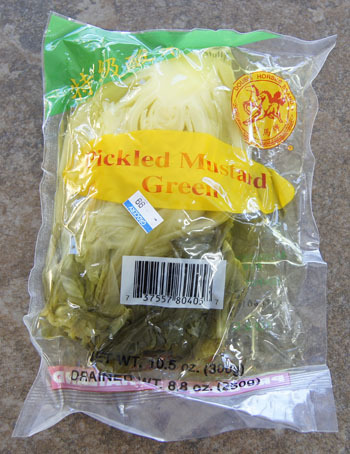 I am using it for all of my salads until it is gone! 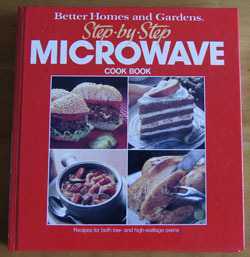 Cookbook #168: Step-by-Step Microwave Cook Book, Better Homes and Gardens, Meredith Corporation, Des Moines, Iowa, 1987. I do like Better Homes and Gardens publications! 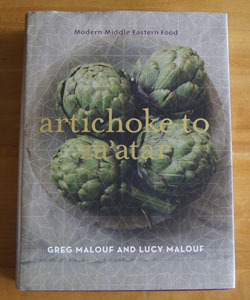 As I leaf through this one, I find myself enjoying most everything: the photos and the writing and the recipes. 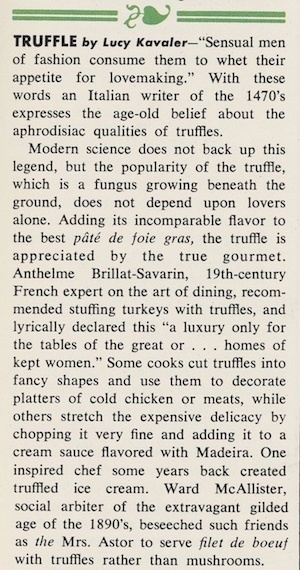 Reminds me of the BH&G Golden Treasury of Cooking that I covered a couple weeks ago. 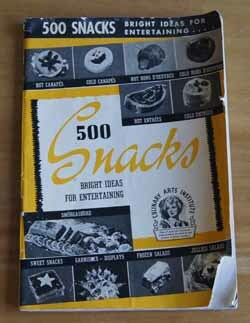 Checking my cookbook database, I find 17 BH&G books, and I have covered all but this one so far – and most I decided to keep. 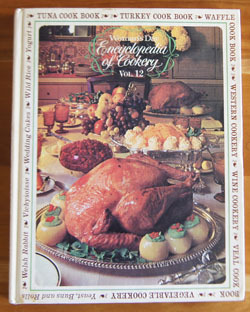 I bought this cookbook for my mother in 1990, when she got a microwave oven. 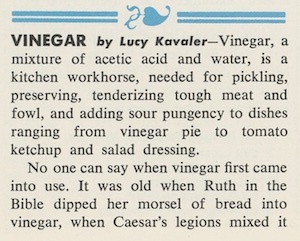 My mother never really liked “new fangled things”. She held out on a garbage disposal for years, and never wanted (or had) a dishwasher or clothes dryer. She relented to a microwave oven around 1990 – it came as the upper oven in her new stove. (I remember how long she needed a new stove, how the bottom was almost baked through by the time my father gave in and bought a new one.) 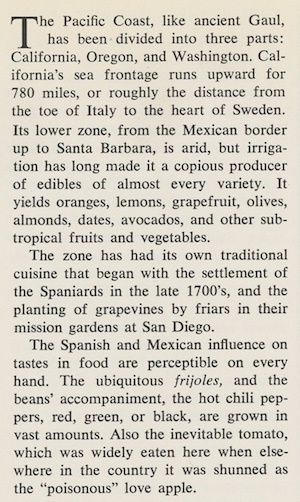 My guess is that I found this cookbook in a bookstore, because I (still) like it so much (and purchasing in a brick-and-mortar bookstore is likely too because online book-buying was in its infancy in 1990). I went into some detail on microwave ovens when I covered cookbook #17, Whirlpool Micro Menus Cookbook. I highly recommend reading that “old” post of mine! It talks of early microwaves and my uncle and how we were a bit wary of microwave ovens at first but how even ex-hippie-me finally added one to my kitchen. Now I would hate to live without a microwave oven, even though I use it mostly for tasks like defrosting or re-heating or melting cheese or making burritos, or baking chores like melting chocolate. Microwave cookbooks encourage the reader to prepare the entire meal in the microwave, from appetizers to soup to stews to meats to breads to desserts. That’s simply not the way I cook! But, I am always looking for ideas and sometimes I need microwave cooking times and methods, so I will keep one or two microwave guides on my cookbook shelf. 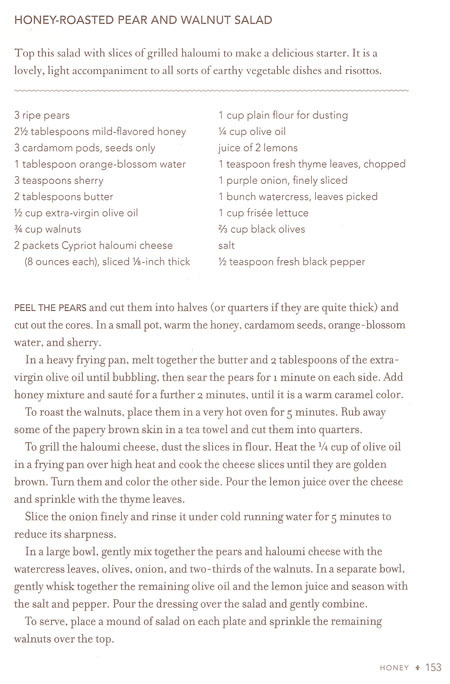 Okay, details on why I like this cookbook. The appetizer section gives lots of good ideas, especially South-of-the Border-Style Meatballs, Pork Kabobs, Taco Chicken Nuggets, and party and snack and nut mixes ideas. 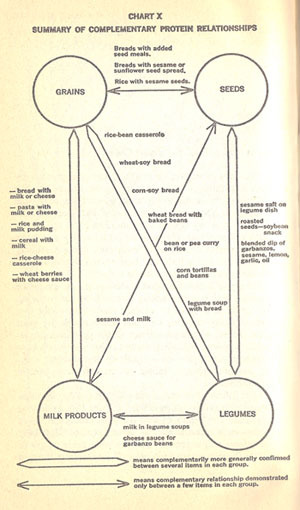 The bread section describes how to use your microwave to raise yeast dough. I like the quick breads Cranberry Orange Loaf and Chocolate and Whole Wheat Ring and the cakes Pumpkin-Raisin Cake and Applesauce Cake, but I’d probably adapt them for a conventional oven. I’ve never thought of making candies like divinity or brittles in the microwave, but it might be nicer than standing over a hot stove. 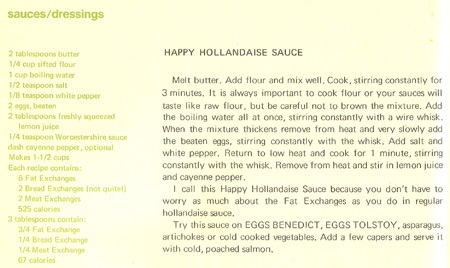 Excellent instructions for scrambled eggs and omelets. Fish and Vegetables En Papillote sounds good. Mother tried and liked “Saucy Tuna-Mac Casserole”. Walnut Bananas Foster! Sounds good for grandkids (if you leave out the rum!). If my regular oven breaks, I could simmer a pot roast in my microwave. I like the Spaghetti Pie, Mexican-Style Manicotti, and Saucy Sausage and Noodles casseroles. Good instructions for defrosting and cooking chicken pieces and a “Creating a chicken casserole” section. I like the chocolate and butterscotch ice cream toppings. Clear instructions for thawing and cooking different foods are throughout the book, and the end of each section has the nutritional analysis of each recipe. Throughout, I am impressed by the clear instructions. Yes, I will keep this cookbook. 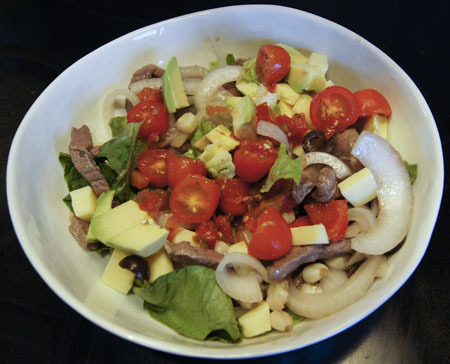 I choose to make Mexican Beef Salad for this blog. 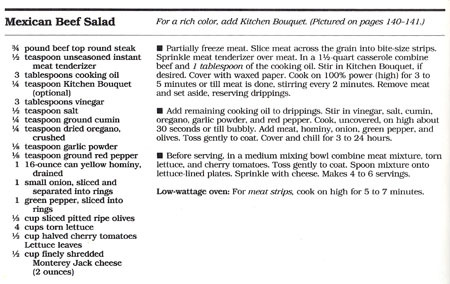 The round steak is cooked in the microwave, plus the prep takes just a few minutes. The whole salad can be prepared in just one bowl. It’s July, and hot, and the less time spent in a hot kitchen, the better! I do think this salad needs a little salsa and avocado. I also put a few tortilla chips in our salads for some crunch. I had trouble finding a small can of “yellow hominy”. At my local supermarket, they only had 6 pound cans of hominy! The labels didn’t say “yellow” hominy, but the picture on one of the choices looked a little yellower than the others. I bought that one huge can, and when I opened it, the hominy inside was pretty pale. And now I have the rest of the can to re-purpose. 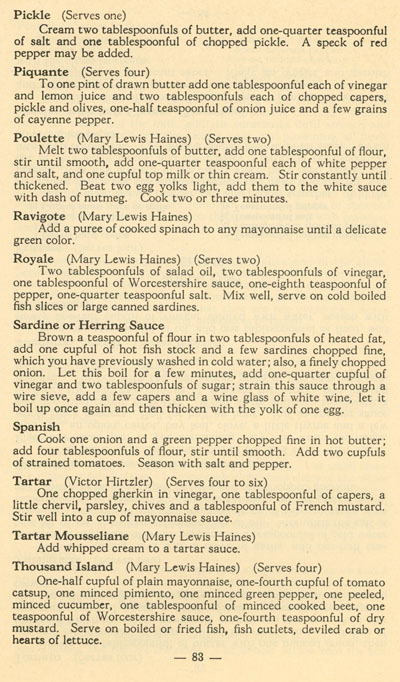 The ingredient amounts in my version of this recipe (below) are approximate. It is, after all, just a salad! Experiment as you wish. 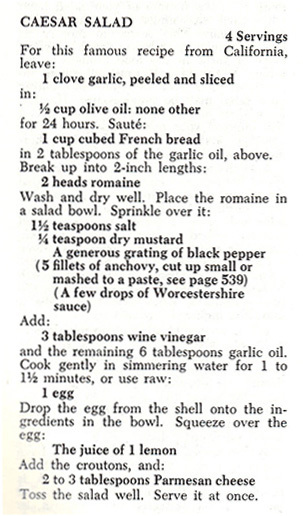 Place the meat in a 1-quart glass casserole. Add 1 tablespoon oil, then microwave on high for 3-5 minutes, stirring every 2 minutes, until the meat is done. Remove the meat from the casserole with a slotted spoon and set aside. Add 1 tablespoon oil to the drippings in the casserole. Stir in vinegar, salt, cumin, oregano, garlic powder, and cayenne. Cook in the microwave on high about 30 seconds, or until it is bubbling. Add the cooked meat, hominy, onion, green pepper, and olives. Toss to coat. Cover and chill 3-24 hours. 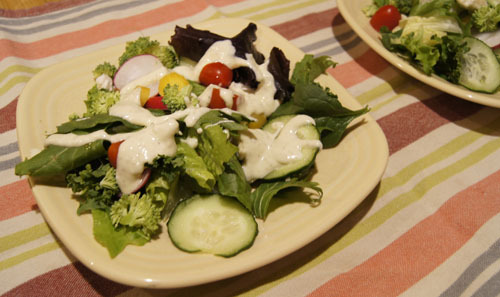 When ready to serve the salad, stir the cherry tomatoes into the meat and vegetable mixture. 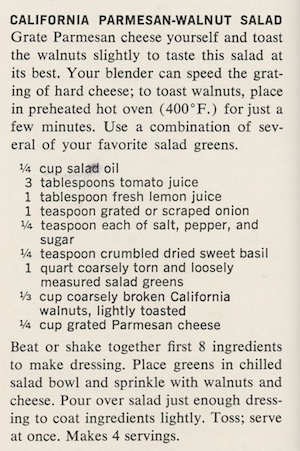 Fill two bowls with as much lettuce as you like. Add the meat-vegetable mixture. If you like, add chopped avocados and salsa, and garnish with tortilla chips. 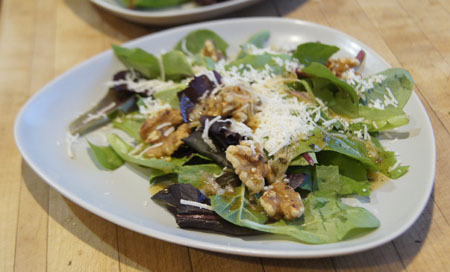 This was a great salad for a hot summer night! I’m sure I’ll make it again. Cookbook #100: Joy of Cooking, Irma S. Rombauer and Marion Rombauer Becker, The Bobbs-Merrill Company, Indianapolis, Indiana, 1964. If my house were on fire, and I was able to save only one of my cookbooks, the Joy of Cooking would be it. It has lived in my kitchen since the seventies. The cover has fallen off the spine and I have many pages marked – but only with note papers, I never wrote in this book, I tried to keep it clean. 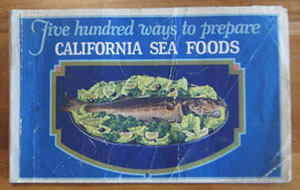 Quite simply, this is my favorite cookbook, and entirely suitable for the placement of “100” in this blog. I know I bought this book for myself, but I don’t recall the trip to the bookstore. 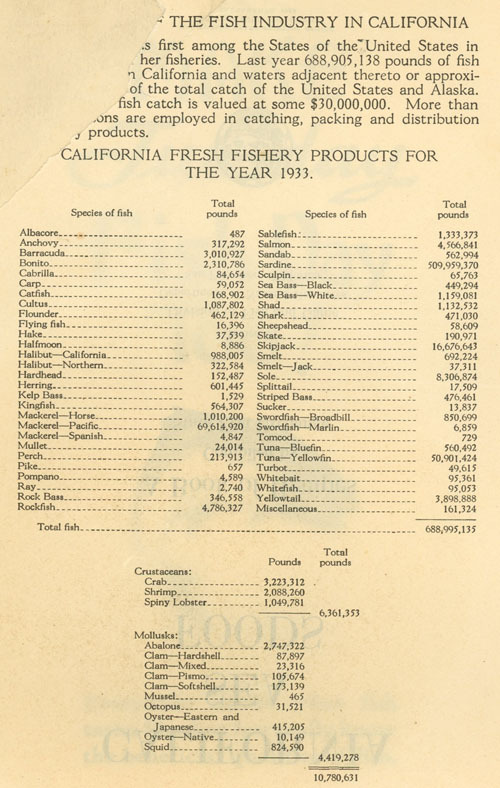 It must have been in 1974, since that is the last listed printing date on the copyright page. That puts me living in a rented funky old house near downtown Boulder, a graduate student, fairly poor, just beginning to expand my cooking repertoire. I am sure that I stood in the store and paged studiously through this book before I purchased it – brand new and hardcover – with money that I had religiously saved up (or maybe the money was a gift from my Mother). It was a big purchase. 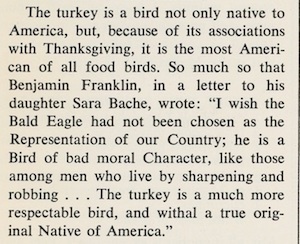 Joy of Cooking has a long history. 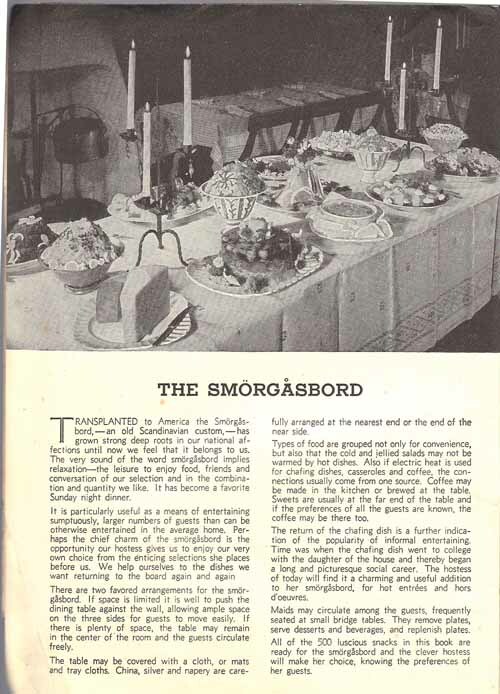 In 1931 the author, Irma S. Rombauer (1877-1962), a Missouri homemaker from an immigrant German family, created the Joy of Cooking. She began as an amateur – she was neither a writer nor a professional cook. 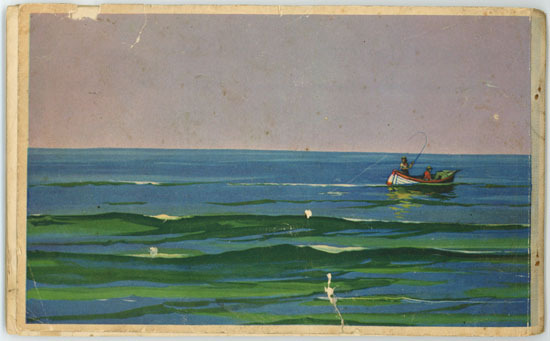 Her daughter, Marion Becker (1903-1976), illustrated the first version of Joy. The second edition came in 1936, and the third in 1943/46. By 1951, Irma Rombauer’s health was failing, and she negotiated a book contract that named her daughter as her sole successor in any future revision. (Wikipedia) Hence, the 4th edition, 1951, is the first authored by both Rambauer and Becker. My edition of Joy of Cooking is the 5th, first copyright 1962. On the Joy of Cooking website, I learn that there is some controversy about this edition. 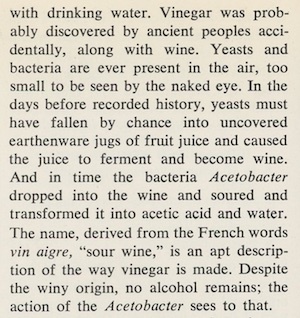 Apparently the publishers released a 1962 version without the final consent of the authors, a version that was “garbled” and fraught with errors. 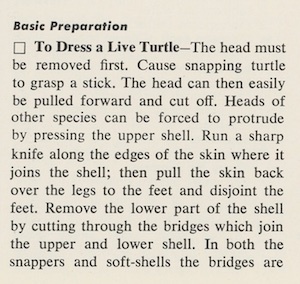 It wasn’t until 1963 that the 5th edition was published in a form acceptable to Marion Becker. Luckily, my edition was printed in 1974. 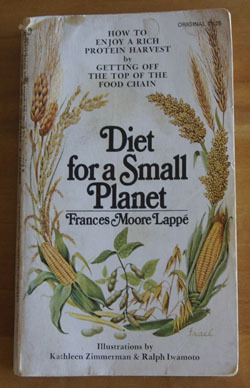 The 6th edition came out in 1975. To many, the 6th edition is deemed the best, although I would vote that the 5th edition is my favorite. After Marion Becker’s death, her sons, Ethan and Mark, took over the Joy of Cooking. The book remained unchanged until 1997. During this period, Bobbs-Merrill folded and Simon and Schuster purchased the copyright. Working with Ethan Becker, Simon and Schuster hired a cookbook editor, changed the writing style of the book, and included input from various professional food writers/chefs. Diehard Joy of Cooking fans often don’t like the seventh edition. The eighth edition, the 75th anniversary edition, came out in 2006. The original voice of the Joy of Cooking was restored, and it includes some of the information deleted in the 7th edition. 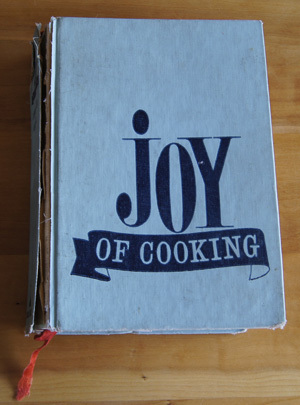 The Joy of Cooking has been in print continuously since 1936 and has sold more than 18 million copies. Pretty amazing. Why do I like this book? It is extremely comprehensive, and has a bent that satisfies my scientific side. If I want to learn how to cook just about anything, I consult this book first. I did in the seventies and I do so today. 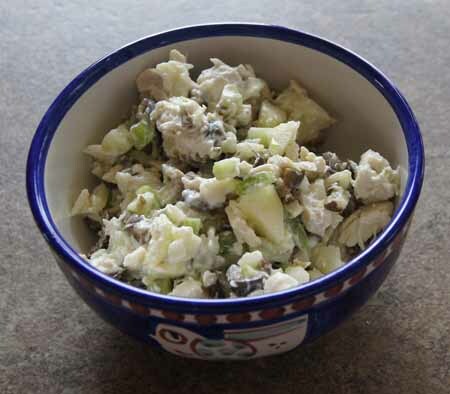 How to make German potato salad? It’s there. How to cook a lobster? Yes. 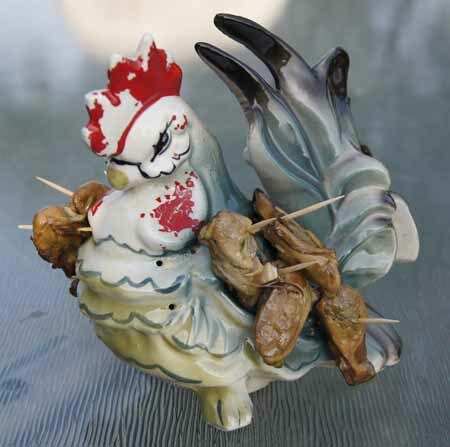 How to pluck a chicken? That too. I like too that the recipe instructions are clear, and written in “action-style”. 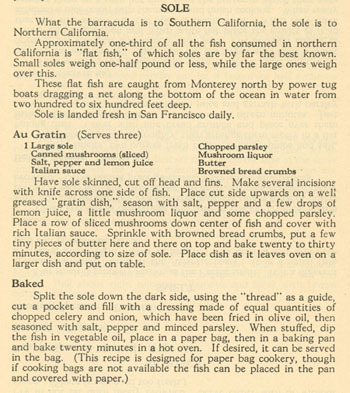 For instance, the ingredients for a recipe’s first step are listed, instructions given, then ingredients for the second step are listed, instructions given, etc. (See my recipe scan below for an example.) 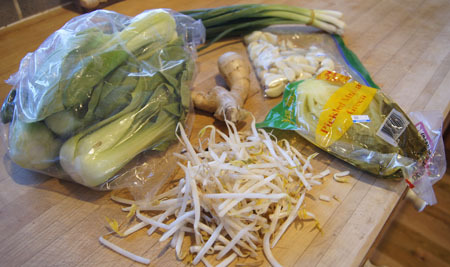 Often, alternative ways to finish a basic recipe are given, such as different fillings for raviolis, or three different variations for a chicken stew. When recipes include methods or ingredients that are covered in a different section of the book, a referral page number is given for the convenience of the reader. And, this book has a great index. The Joy shows a definite German influence. As such, it appeals to my own German heritage: three out of four of my grandparents were mostly German. Thriftiness, industriousness, stubbornness, holding to traditions – these are the traits that I associate with my German ancestry. Irma Bromauer and her whole family worked hard to get this book out and keep it updated over many decades. And it’s a long book – my edition of Joy is 849 pages. That is a ton of work! Oh – this is touching. In the dedication, Marion Becker writes: “Working with Mother on its development . . . ” Note that she, like I, called our mothers “Mother”. Not mom or mommy or ma. Maybe it’s the German heritage. I always use a Joy of Cooking recipe for my cheese souffles, blender hollandaise sauce, cooked red cabbage, and potato pancakes. 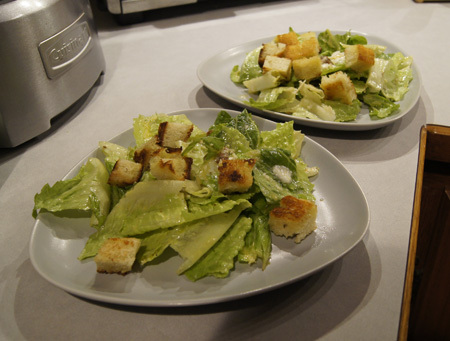 And Caesar’s Salad, which I decide to make for this blog. I’ve made this tons of times. If I have a Caesar’s salad in a restaurant, I always compare it to the Joy’s version, and they rarely measure up. 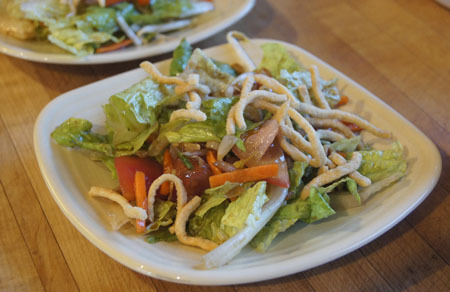 This is a “classic” Caesar’s, no mushrooms or other vegetables, and the perfect dressing, made on the salad rather than in a bottle. If you follow this recipe, you will be successful! 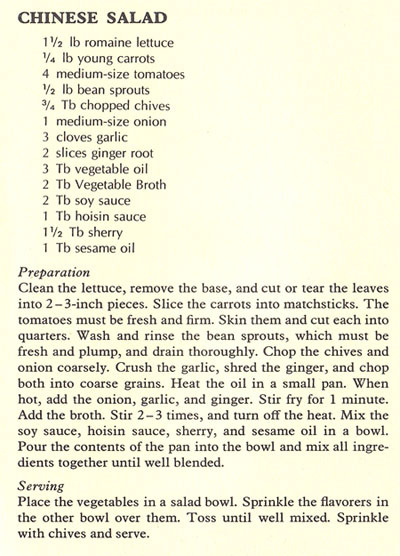 I am not going to type in this recipe, since I always refer to this cookbook to make it. I always halve the recipe for the two of us, but I still use a whole egg. Remember to put a clove of garlic in olive oil early in the day. Use fresh lemon juice, no other. I prefer grated fresh Parmesan cheese rather than the stuff that is sold in a can. I use the amount of romaine lettuce that I think the two of us are hungry for. Anchovies? My husband loves them, I only like them, so I put more in his salad. When adding the vinegar, lemon juice, and oil, I usually measure out the recommended amounts, then add a portion of each, toss the salad, taste, and add more if I feel it needs it. The croutons are stars in this salad. Make them fresh and just before you put the salad together. 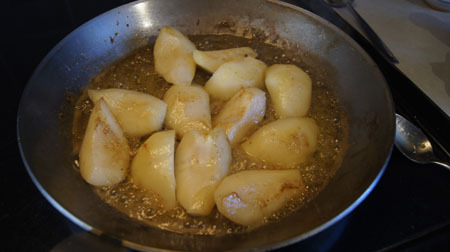 And use that garlic-soaked olive oil to fry them. Mmmm. I still have lots of romaine. I think I’ll make Caesar’s salads again tonight! 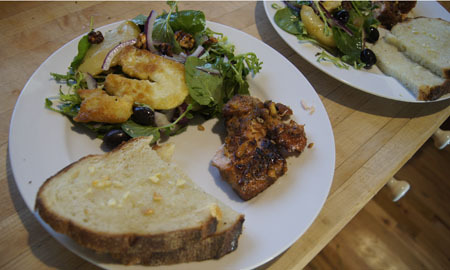 Thank you Joy of Cooking for helping me make a great dinner, once again. Cookbook #99: The Calculating Cook, a gourmet cookbook for diabetics and dieters, Jeanne Jones, 101 Productions, San Francisco, CA, 1972. The Calculating Cook, a gourmet cookbook for diabetics and dieters is one of my old-favorite cookbooks. 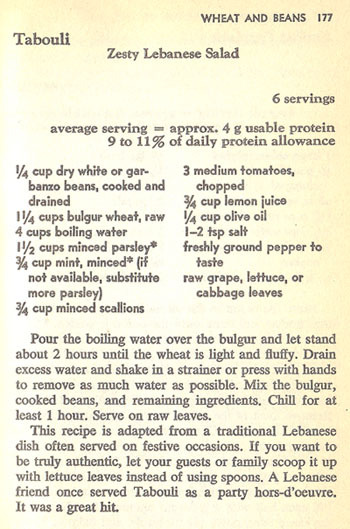 I learned about the diabetic “exchange diet” from this cookbook, a diet plan that correlated well with a health club’s plan that I acquired in the early 70s. I still make crepes from a recipe in this cookbook. 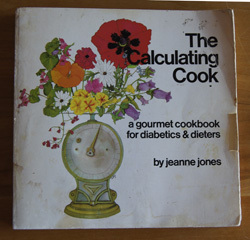 The Calculating Cook was Jeanne Jones’ first book (as far as I can tell). Since then, she has authored over 30 books, including Cook It Light Menus for Every Occasion, Homestyle Cooking Made Healthy, and Canyon Ranch Cooking: Bringing The Spa Home. She writes a syndicated column called “Cook it Light” for King Features, a kind of “Dear Abby” column where people write in with recipes that they would like to lighten up. She also consults for spas, restaurants, and food companies, lectures at conferences, and has appeared on TV talk shows. A couple bios: Jeanne Jones website and Women’s International Center. This link to the Akron Beacon Journal website illustrates some of her Cook it Light columns, and here is one on the Arizona Republic. During my searches, I learned that she is now in her late seventies and lives in Laguna, California, just down the coast from where my husband grew up. In 2013 she was robbed at gunpoint in that home and in 2014 the robber was convicted. I saw a photo of her home online, and it is gorgeous. She was even the executive producer of a film, The Streetsweeper (2003). The exchange diet is a food choice system designed to help diabetics plan manage their glucose levels. Food exchange categories include: fruit, bread/starch, vegetables, milk, meat, and fat. This is a balanced, sensible diet plan that eliminates calorie counting because it’s already been done for you, all you have to do is adhere to portion size and choose the appropriate number of exchanges from each food category each day. 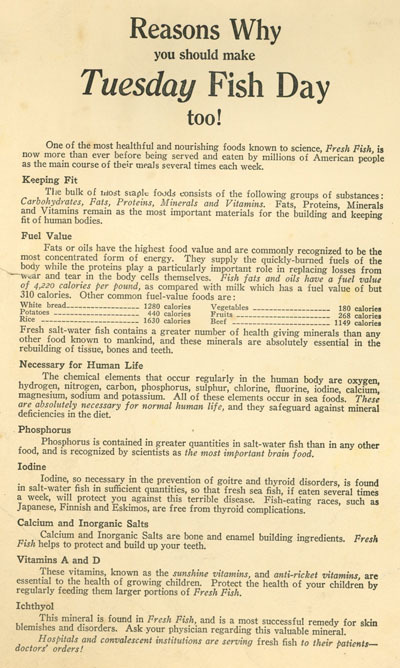 More information: USDA National Agriculture Library on the diabetic diet and University of Arkansas’ food exchange list. 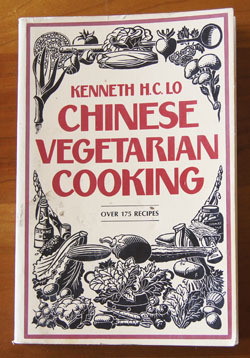 What to cook from this book? 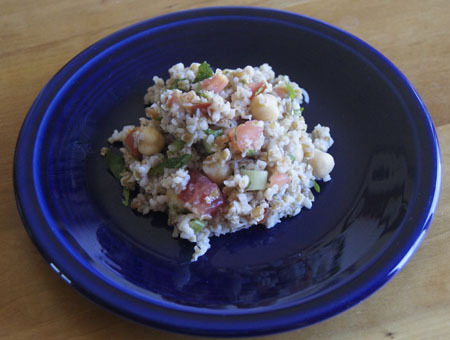 I have some trouble finding a recipe in The Calculating Cook to cook for this blog. Why? So many of the recipes call for things that you need to prepare and have on hand, like “tomato juice ketchup”, “jelled milk” (a concoction of skim milk, water, and gelatin), or “magic mayonnaise”. In today’s supermarkets, I can find thousands of low-calorie basics, so no longer do I have to resort to homemade tactics. Many recipes call for sugar substitutes; I prefer not to use these. While I learned a lot from this book when it was new, I have since graduated from it: I have the knowledge in my own head to create light versions of almost any recipe. Thus this sauce has close to a 1000 calories in 1 cup. The Calculating Cook’s version has about 350 calories in a cup. That’s quite a difference! 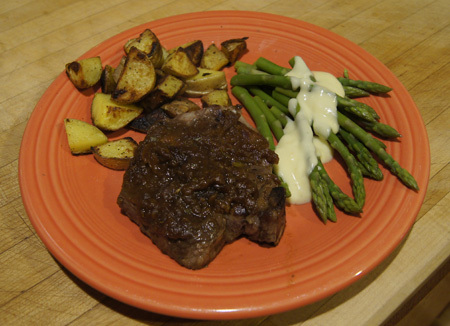 To go with the hollandaise-asparagus, I find a recipe on Jeanne Jones’ website: Lamb Chops with Herbed Apricot. My slightly changed and re-named version of this dish is below. The original recipe calls for a can of fat-free chicken stock. I usually keep homemade stock on hand, so I used that instead. I always de-fat my stock by placing it in the refrigerator overnight. And that’s exactly how The Calculating Cook tells me to make stock. Maybe I learned this technique from this very book! Melt the butter and then add the flour. Cook and stir for at least a minute (do not allow to brown). Add the boiling water all at once and stir constantly until the mixture thickens. Remove from heat. Whisk the eggs, then add them in a slow stream to the butter-flour-water mixture, whisking constantly. Return the pan to low heat and cook about a minute (to cook the eggs), then stir in the salt and pepper and lemon juice. Serve. The leaner the lamb the lower in calories this dish will be. I found bone-in lamb chops, and they had a bit of fat on them that I tried to cut off. Sprinkle both sides of the lamb chops evenly with the garlic powder, salt and pepper. 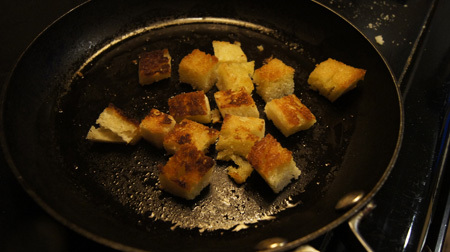 Heat a non-stick or a cast-iron pan over medium heat. Add a few drops of oil or non-stick vegetable spray if you wish. Brown the lamb chops on both sides. Combine the dried apricots and the chicken stock in a saucepan and boil, uncovered, for about 5 minutes. Cool a bit, then put in a food processor or a blender. 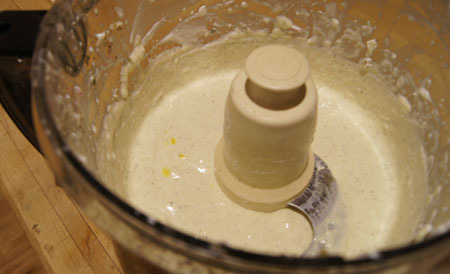 Add the herbs, nutmeg, salt and vinegar and process to a puree. Pour the mixture over the browned lamb chops in the pan, cover, and simmer for about 10 minutes. This meal was a hit, from the asparagus with light hollandaise to the lamb chops with apricots. I thought the sweet apricot topping counterbalanced well the distinct flavor of the lamb. I used fewer apricots than called for. I purchased a 5 ounce bag of dried apricots, and according to the nutrition label, it has “4 servings at 100 calories each”. Thus adding the original amount of 4 ounces would have added close to 400 calories to this dish for two people. So, I cut the amount of apricots. My apricots didn’t contain any chemical preservatives, so they were dark brown. Not pretty, but tasty. p.s. A couple days later, I reheated the leftover light hollandaise sauce, and it was still very good – over broccoli the second time. 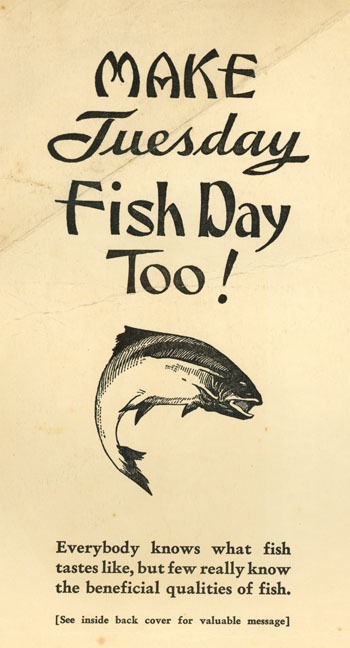 It would also be good over fish, I think.